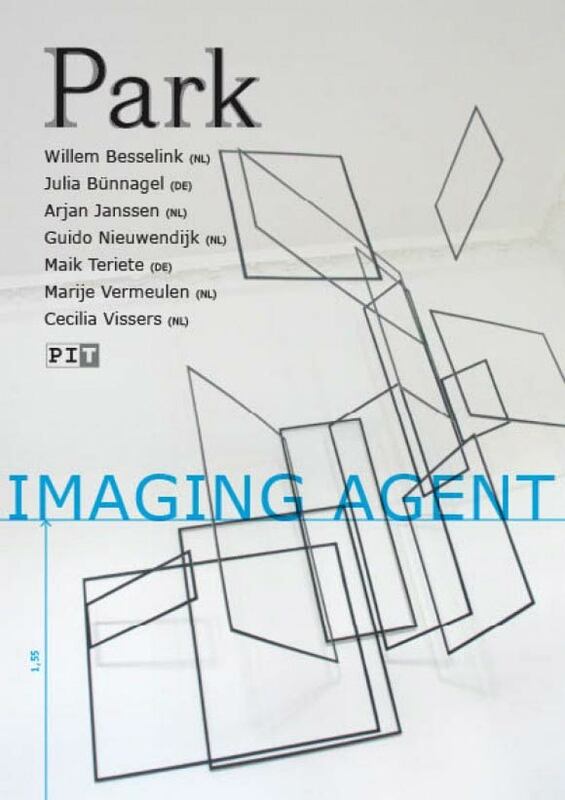 The title refers to itself, an Imaging Agent. In this particular case starting point is an imaginary horizontal line at 155 cm above the ground. This line forms the base and combining element for the work the seven artists developed for PARK. The opening takes place on Saturday May 31, the opening speech is performed by Hendrik Driessen, director Museum De Pont in Tilburg. 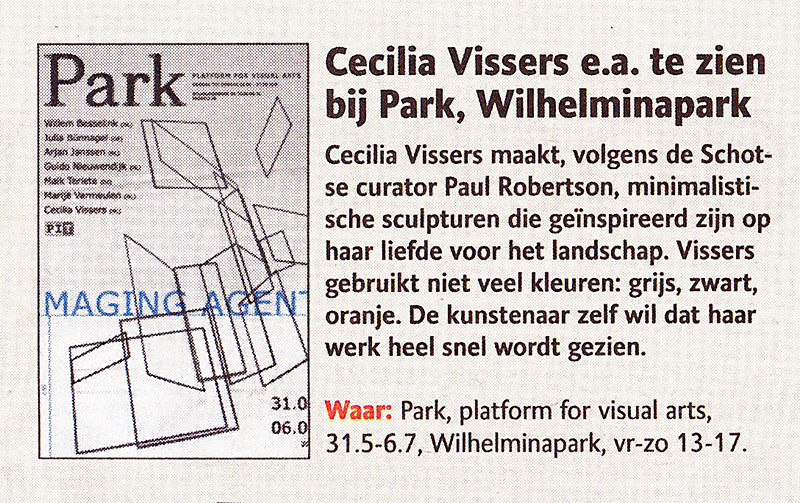 Willem Besselink (1980) observes and records. He is fascinated by the structures and systematic tools behind the seemingly chaotic scenes that surround us daily. His works always challenge the viewer to recognize the structures in apparent chaos. The starting point of the work in this exhibition is a cube of 155 x 155 x 155 cm with a center at 155 cm height. In many ways he varies with these dimensions by increasing and decreasing numbers. The work of Arjan Janssen (1965) looks sleek and mathematically. It has a minimal form and sober building. Both his paintings, drawings and installations carry pure formality in itself. They result from very thoroughly considered technical decisions and they have inscrutability at the same time. Marije Vermeulen (1976) makes paintings and murals in which color, energy and clarity are important aspects. The precisely executedsurface devisions, forms and color combinations are rooted in reality, but are developed in a comprehensive sketching process. Common actions therein are halve, tilt, repeat and move. Architectural elements that are present in the room often play a role in her murals. In the installation Reframing Maik Teriete (1975), the shape depends on the motion of the air in the room caused by visitors, through open windows or the alternation of cold and warm air. The title Reframingrefers to a term in psychology. It articulates a process of reconsideration and re-evaluation. The installation refers to this. The patterns and perspectives appear and disappear for the viewer. They are just there for a moment and cannot be hold, a coincidence like clouds in the sky. Cecilia Vissers' (1964) wall sculptures are completely autonomous objects, introverted, beautiful and useless. They never seem to betray their genesis and origin. Despite the purity and visual tension it is not clear whether cuts are made ​​(from outside), or the material has formed itself (from inside). The works of Julia Bünnagel (1977) have a cool appearance, in her imagery she uses reduced basic geometric shapes. The Space in Between is based on the ideas of Friedrich Kiesler, and more specifically to 'Raumstadt' he developed in 1920 in which painting, sculpture and architecture are inseparable. The fragile installation sprawls across the room, perspectives change when you walk around it. The glossy finish reflects both the space and the green lines without interruption. An imaginary space is created. Guido Nieuwendijk (1967) is working in extremes. His murals exude greatness, the paintings on panel however are introverted. But his signature is unmistakable: with his bright colors, geometric shapes and a sophisticated structure he seeks the boundaries of the minimal. The titles of the works refer to trivial disturbances, repetitions and arrangements.